On Sale: November 1, 2018 – January 31, 2019, 3:00 p.m.
A maximum of 2,000 (two thousand) consecutively numbered tickets will be available for sale. Sales will begin on November 1, 2018 and continue until 3:00 p.m., January 31st, 2019. Each ticket will be sold for $20 each or 3 for $50. 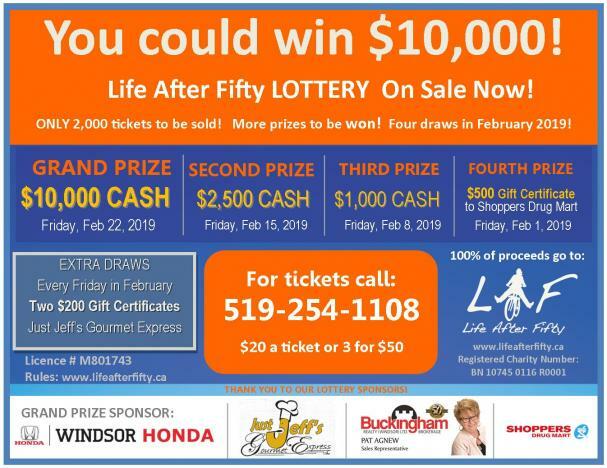 All draws will be held at 635 McEwan Ave. Windsor, at 12 noon each Friday in February 2019. Prizes totaling $15,600 are to be awarded through random draws (outline above). Gift Certificate prizes are awarded as presented and are not redeemable for cash. Winning raffle tickets will be placed back in the container for further draws in the raffle. Winners’ names will be published on the agency website, Facebook page and on bulletin boards, and distributed via e-mail blasts. Centres for Seniors Windsor shall be responsible for awarding prizes and making all reasonable efforts to contact prize winners by telephone, mail and/or e-mail. Tuesday, November 27th is Giving Tuesday Canada! GivingTuesday is a global day of giving. After the sales of Black Friday and Cyber Monday, GivingTuesday is a time to celebrate and encourage activities that support charities and non profits. Whether it’s making a donation, volunteering time, helping a neighbour or spreading the word, GivingTuesday is a movement for everyone who wants to give something back. Volunteer: We require volunteers for the many activities to help seniors, support programs and to contribute to our community. Our network of 300 volunteers help in so many ways. Have some extra time to help? Contact us today! Non-Monetary Donations: Do you have items at home taking up space and collecting dust? What about that craft project you bought, but never used? Have you thought about donating it to LAF? Your donation of good items such as yarn, cloth, books, cards, envelopes, etc can be put to great use here at LAF for craft workshops, learning and operations. Donations welcome at the door or call 519-254-1108. Monetary Donations: As a not – for – profit, we require fundraising and donations to help us deliver over 100 programs and services. Once again, Life After Fifty and its members will help our community by keeping them warm and supported.The annual Coats for Kids program has started. 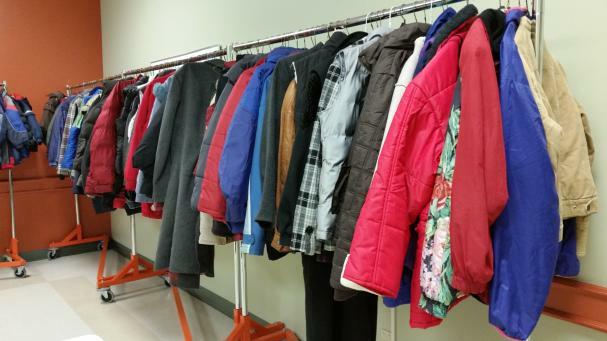 Both our East Side and West Side locations will collect new and like-new coats for kids and adults. We also take essentials to keep us warm in winter, such as mittens, hats and gloves too. The West Side Centre will be a distribution centre November 15th from 10:00am - 3:00pm.